One of the most important lessons you will learn in this life is about personal boundaries. There may not be a need to construct four walls made of titanium, but you will emotionally benefit from mentally placing borders with people who don’t necessarily have the spiritual health of your Soul on their agenda. I am sure you can name at least one of these kinds of people in your life, perhaps several. As a human being, we are taught to put up with, overlook stuff, just get over it, they didn’t mean any harm and saying the word sorry is supposed to make everything ok.
For Sensitive people it just doesn’t work that way. We are wired differently than your normal human being, and thankfully so. Sensitive beings tend to forgive but all is not forgotten. Every time we get hurt, the emotional wound doesn’t dissolve away into thin air, it sticks to our ribs and causes us to suffer. We hurt more than most, so over time our ribs can get really heavy, enough to weight us down and make us ill. Boundaries are important, although placing them can be quite difficult. I think what we need to realize is that we are not made of titanium, sure we are as tough as nails but eventually things start to wear down when they are over used and this is the case when it comes to the Soul of who we are. Letting people walk all over us because of our innate and natural compassion intuitively will and can only last for so long, at some point in your life something will bring you cause for concern and things inevitably will have to change. This change will come about by your own free will, or the will of the Universe, either way, listen carefully to the messages and where they come from. Free will you were born with, so get busy and get using it, speak your truth and let those people who have crossed your personal boundaries before in the past know that you mean business ‘now’. You deserve to be respected and you deserve to have self-worth, your challenge is to really believe that you do and embrace it with all of your being. 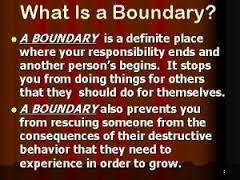 Boundaries, do you have yours in place?